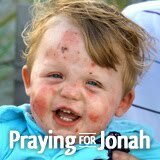 baby food and a birthmark? so the month of august has been lots of fun... something different every day with little man! 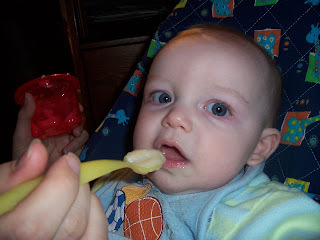 you know his first tooth came in july 31, followed by his second one on august 1. so when his bottom teeth came in, we immediately thought... we need to feed this boy some FOOD!!! up to this point we had only given trace breastmilk and when that was gone, formula. 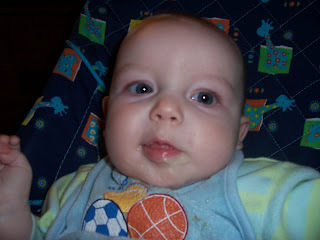 it's funny how his teeth came in, so t-tiny, and we just knew "he must want baby food now!" and he did want it, and he loves it! 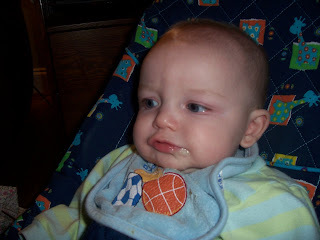 we started with the rice cereal, and he just gobbled that stuff up! since then we have done several first fruits and veggies, including applesauce, bananas, pears, peaches, sweet potatoes, squash, and sweet peas. he is such a good eater, he ATTACKS the spoon and cries when i can't get the next bite in fast enough! 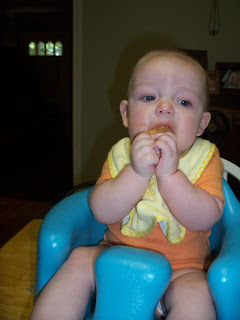 and a few times we have braved the teething biscuit, which trace thoroughly enjoyed! he knawed (sp?) on that and actually bit it in 3 pieces!!! he loved it. it was such a mess, but it made for some cute pics! trace thinks he is so big with his teeth. they may be little, but MAN, they are SHARP!!!! anyways... so the babyfood adventure has begun. i made nate get the brand new high chair down from the attic and put it together. so we have had to rearrange the kitchen to make a place for all the babyfood, plastic bowls, spoons, highchairs, ETC!!! what fun!!! ok, so now the rest of the "new" discoveries in august. so nate left last thursday for the race in bristol, tn. it's just me and trace until sunday. wow, that's lots of mommy and me time! so we had a few things planned so we wouldn't be bored at the house all weekend. so friday nite we went to a family birthday party. i was changing trace's diaper and putting him in his pj's. for some reason, i saw this little "spot" on trace's upper thigh. i asked my mother-in-law to get me a diaper wipe, because i thought there was some poop or dirt or something on his leg. when it didn't wipe off, i thought, well maybe it's a bruise. about that time, meme says, "i've always loved that little birthmark." WHAT?!? hold on a second, let's back-up. yes, my child is 5 1/2 months old. AND THIS IS THE FIRST TIME I HAVE SEEN HIS BIRTHMARK? oh my goodness, i felt like a horrible mommy!!! i took a picture with my phone and sent it to nate with a short, "what the heck? trace is 5 months old and i just found a birthmark!" message. he texted back with the same "WHAT?!?" ok, soooo, somebody, please tell me i am not crazy, these things go unnoticed all the time, right? i need another mom to have the same kind of story, it will make me feel much better! well, let's just say that maybe the "birthmark" hasn't been there since birth, who knows. whatever the case, i saw it for the first time last week. so now everytime i am changing his diaper or outfit, i make a point to look at his cute little birthmark. here is the pic i sent nate... i know it isn't that noticable, but come on now... i think we should have seen it before now, right? honestly... NO! i am not ready for some football. not on monday night, not on saturday afternoon, and not on sunday. it's kinda like green eggs and ham... i do not like football sam i am!! i know, i know, how can i be southern and not like football. who knows... but i never really have liked it. 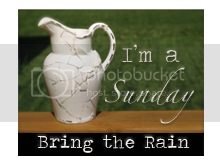 BUT it is coming up whether i am ready or not! and the 2 most important guys in my life practically LIVE for football, and they are counting down the days til the first game of the season. yep, trace is already counting... isn't he so smart! LoL! anyways, the first FSU game is september 3, which is less than 2 weeks away! yes, i know we live in alabama where you bleed red and white OR blue and orange. 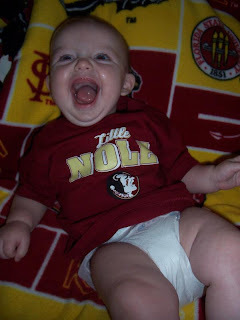 but not the nathan whitt family... we bleed GARNET AND GOLD! not the prettiest colors if you ask me, but i wear them anyways! and so will trace! even though i could think of many other things to spend my precious time and money on, if nate likes it, then so do i! so we will all be sporting our florida state gear soon. trace has the cutest little onsie, bib, and hat. but the problem is it's almost too small. 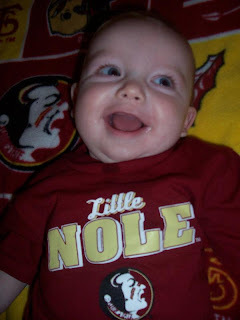 so to suprise nate, i ordered trace a new fsu t-shirt for his first big game. i have to admit, it is pretty cute! really, it was just an excuse to have another photo session with my little man! so i hope you like the pics! and i think it's safe to say that trace is definitely lovin his new shirt!! could his smile be any bigger? daddy is lovin it too, and mama is kinda getting used to the idea of our future quarterback. so watch out FSU - here we come!